HB 1015 was approved by the Louisiana state legislature on June 2, 2014 and signed into law by the Governor on June 23, 2014 as Act 833. It became effective Aug. 1, 2014. Our analysis of the final version of HB 1015 is available here (PDF). EdWeek “On Special Education” blog post is available here. A bill working its way through the Louisiana state legislature (H.B. 1015) proposes significant changes to the manner in which the state’s 70,000 + students with disabilities will be educated. Designed to address the exceedingly low rate that students with disabilities earn a regular high school diploma (see table below), H.B. 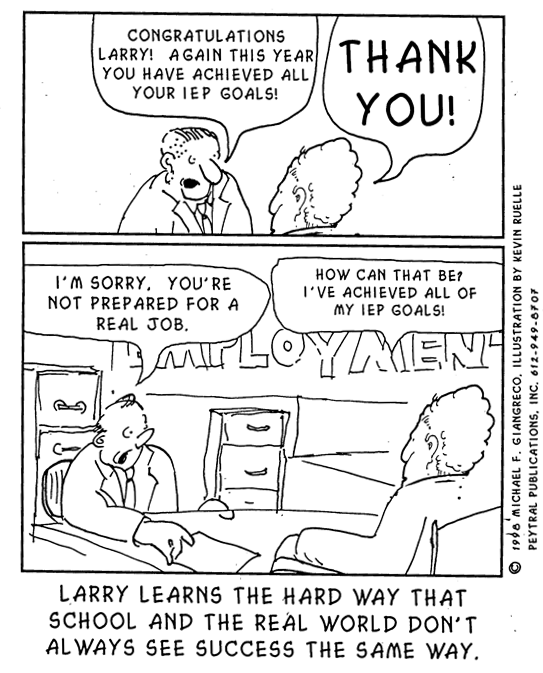 1015 will allow IEP teams to substitute IEP goals for any and all of the state’s graduation requirements that apply to all other students. The same applies to grade promotion. The proposal has lots of support – from parents, from legislators, and from the state’s Developmental Disabilities Council, which is working hard for its passage. There is alot of misinformation associated with the rationale for this bill – primarily the inaccurate claim that 28 states leave graduation requirements for students with disabilities up to the IEP team. While many states allow IEP teams some level of involvement in matters related to how a student will exit school, most are restricted by state and local policies. Few are as sweeping as the policy proposed by H.B. 1015.
students, parents, institutions of higher education and employers will be confronted with a regular diploma that means little if anything to life beyond school – and means something different for every student. The poor academic performance of students with disabilities in Louisiana shouldn’t be used as a rationale for moving away from state standards, assessment results, and graduation requirements. While H.B. 1015, if implemented, might produce a bump in graduation rates, it will do little to improve academic performance. In fact, states with the highest graduation rates for students with disabilities have very tough and tight policies – states like Massachusetts and Maryland. As articulated by Jeff Spitzer-Resnick in his recent blog post, its time to Stop Paternalizing Children with Disabilities. As first appeared in Education Week January 28, 2014. Reprinted with permission from Editorial Projects in Education. The writer is director of The Advocacy Institute and author of Diplomas at Risk: A Critical Look at the Graduation Rate of Students with Learning Disabilities, a 2013 report published by the National Center for Learning Disabilities. The sponsor of H.B. 1015 misrepresented the purpose and recommendations of this report in his opening statement to the House Education Committee on April 29, 2014. The National Center for Learning Disabilities has sent this letter to the members of the Louisiana House and Senate. Letter in opposition signed by 8 national organization. The Huffington Post article published on May 15, 2014. The “On Special Education” blog published on May 21, 2014. Analysis of final version of HB 1015 by The Advocacy Institute and the Center for Law and Education.